Black Forest, Virginia, Capocollo, Honey Roasted, Honey Maple – All incredibly tasty in their own right, but understanding how each of these deliciously sweet and smoky meats came to be and what makes them each so uniquely delectable is a secret often veiled in mystery. We’d like to invite you behind the curtain. Welcome to Deli Ham 101. Yes, there really is a Black Forest. Schwarzwald, pronounced [shvahrts-vahlt], is the lush, forested mountain range in southwestern Germany, more commonly known as The Black Forest. Gorgeous foothills and pastures grace this wooded region bound by the Rhine valley to the west and south. It’s namesake ham is known for it’s delicately blackened skin and light, smoky flavor. That dark edge comes from spices applied prior to smoking. Salt, garlic, coriander, juniper and pepper to name a few. Black Forest ham is smoked over pine or fir and the whole process can take up to three months. It’s a very moist ham and gets much of it’s distinct flavor from the types of wood used in smoking. 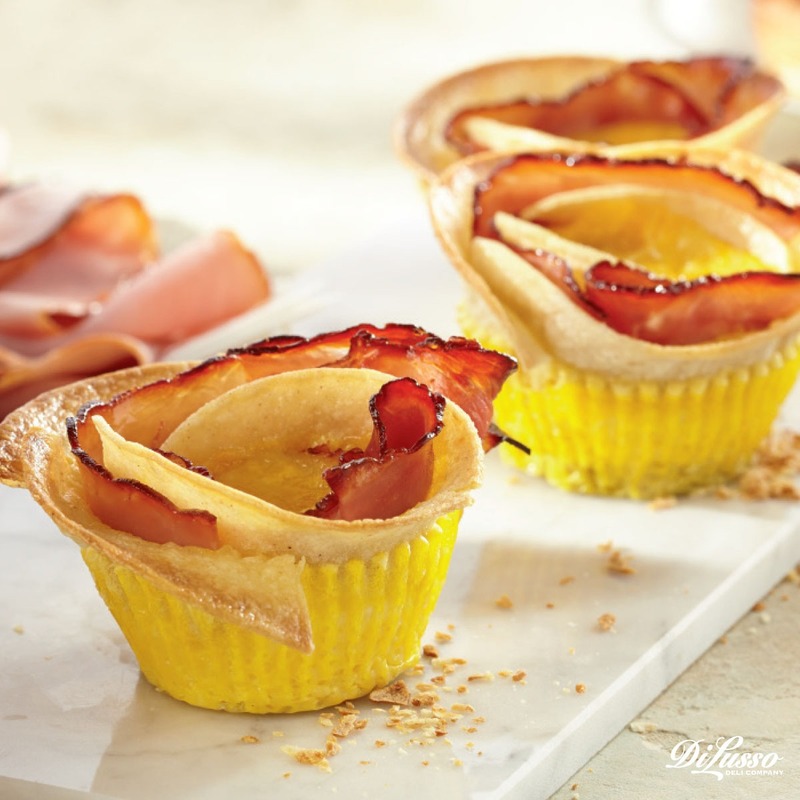 DI LUSSO® Black Forest Ham is carefully crafted and modeled after these time honored traditions. Black Forest ham is extremely versatile and can be easily substituted for other styles of ham in virtually any of your favorite recipes. 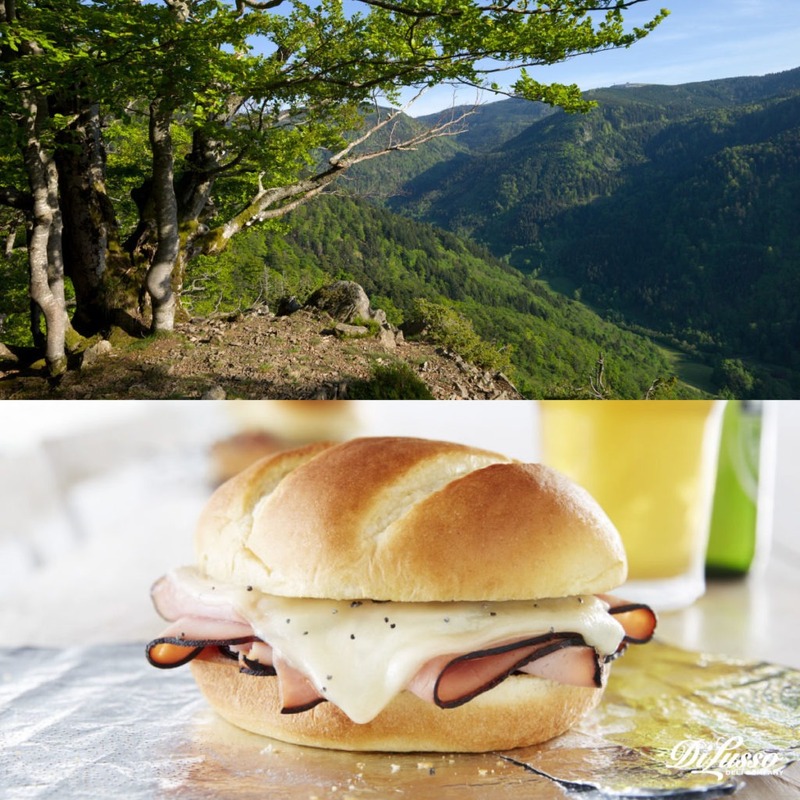 Some of our favorites include Savory Breakfast Cups, which pair a smooth and smoky Gouda with the lovely edged Black Forest ham, and this Hot Ham and Swiss Sandwich. It too showcases the that beautiful edge. The the nutty notes of the Swiss cheese are perfect compliment to the light, smoky, classic Black Forest flavor. Virginia ham, also known as country ham, originates much closer to home, first appearing around 1944, in rural Tennessee, Virginia, Georgia, Kentucky and the Carolinas. But country ham is really more about the style of smoking and curing than it is the location. It’s smoked over wood from oak, walnut, apple and more frequently, hickory trees. Virginia ham has a slightly milder taste than Black Forest and is patiently cured for as long as a year or more. 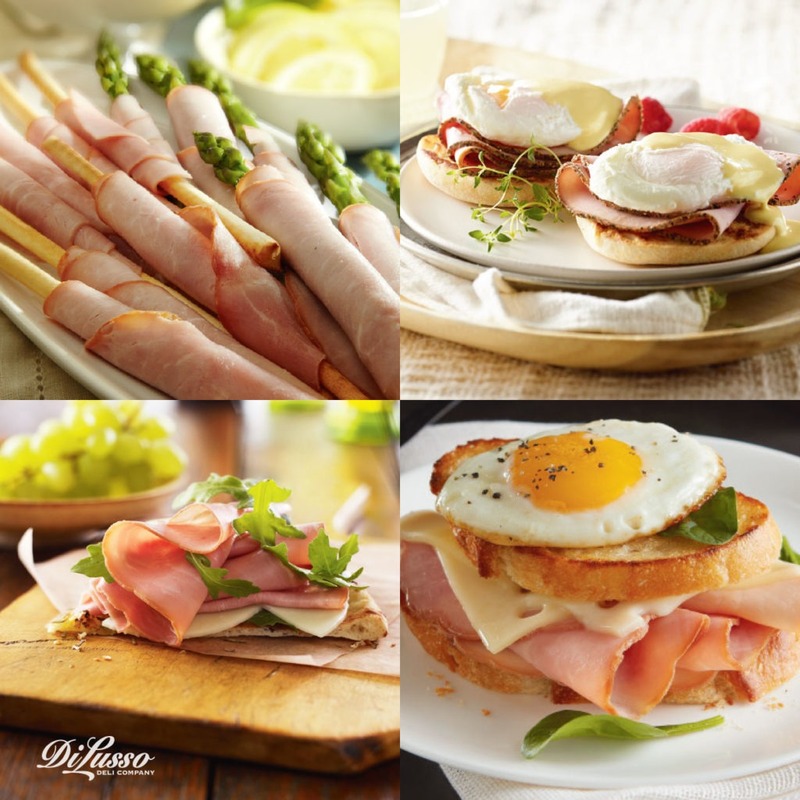 DI LUSSO® Virginia Ham is a classic-tasting ham and a perennial sandwich favorite. It’s cooked, cured and smoked in the traditional method honoring it’s American roots and celebrating it’s widely loved flavor. Like Black Forest, it’s versatility allows it to both shine and compliment in many recipes. As beautiful to serve as they are delicious, Pear, Ham and Provolone Crostinis are a lovely blend of sweet and savory and make a perfect appetizer for entertaining at home. 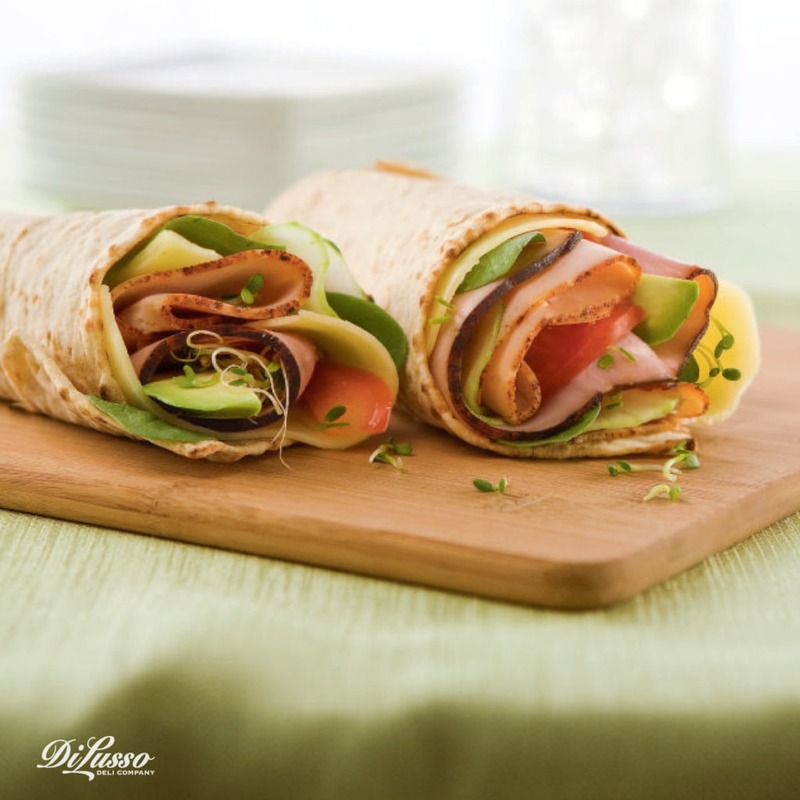 Our Ranch Club Wrap is a great lunch option. It’s loaded with fresh vegetables like cucumber, avocado and spinach. We love it with Virginia ham. It’s a just-right balance of cool crunch and luscious smokiness. Capocollo is a traditionally cured specialty meat made from top quality pork shoulder. It’s enhanced with spicy seasonings and dry cured for an authentic, bold flavor. Like salamis, Prosciutto and other dry cured sausage style meats, it’s a favorite in antipasto plates. Typically sliced very thin it’s also a delicious flavor accent to grilled sandwiches like paninis, muffulettas and Italian subs. Try serving our DI LUSSO® Hot Ham Capocollo in this beautifully festive Fall Platter at your next celebration or impromptu gathering. 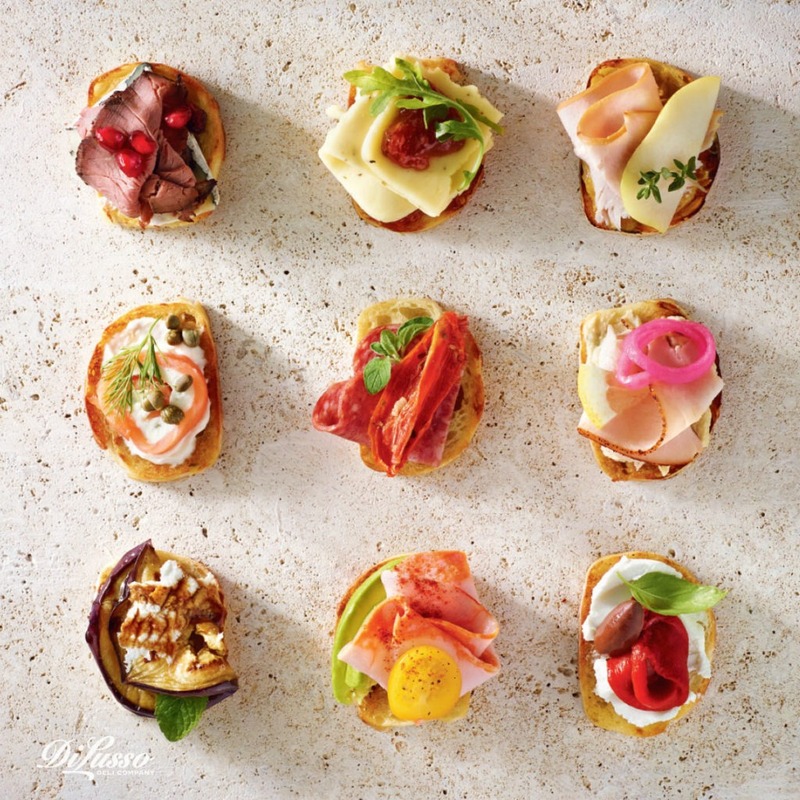 Create bite sized bursts of flavor with Global Inspired Tapas using a variety of delicious meats, cheeses and fresh toppings. Just add a pour of your favorite wine and you’re set for entertaining in style. At Di Lusso each of our hams are handled by hand and patiently smoked with real wood or carefully roasted to perfection. Specialty hams like our Honey Maple, Brown Sugar and Black Peppercorn hams are made with real honey, real brown sugar and real peppercorns. We never use artificial flavors or colors in any of our meats. In fact all of our meats are gluten free and contain no fillers and no MSG. It’s this attention to detail and tradition that give our meats such an authentic, rich flavor. Here are just a few of our favorite recipes featuring some of our most loved specialty hams. Florentine Flatbread with Honey Maple Ham, Provolone and fresh arugula. Eggs Benedict with Double Smoked Black Pepper Ham. Ham-Wrapped Grissini and Asparagus with Honey Roasted Ham. Ham and Swiss Breakfast Sandwich with Brown Sugar Ham and fresh basil.